Meets In Collingwood, Ontario, Canada. 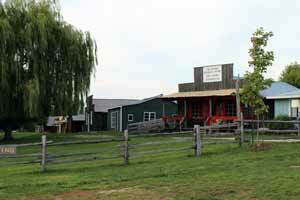 We're back in business at our new club house at Bygone Days Farm in Collingwood. 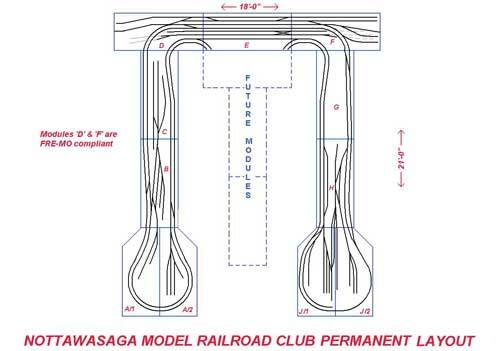 Update: The construction of our new railway and club news can now be followed at the Nottawasaga Model Railway Club. This is a heritage site and a pioneer-type village with loads of regional artifacts and equipment. Our new clubhouse is in one of the old buildings and we start with a room about 50 feet by 20 feet. An interior design committe has worked up a plan and our construction committee has already started work patching the roof and getting the building ready for occupancy. 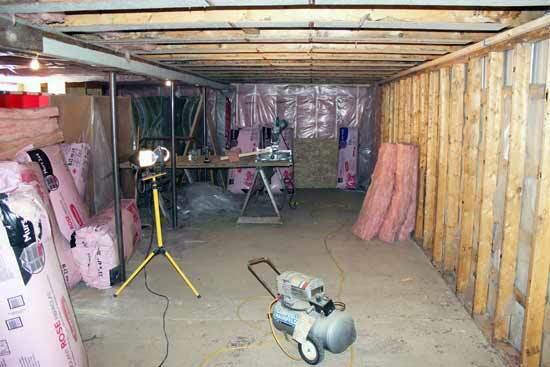 We need to insulate and bring in heat before going much further, but the renovations are underway. 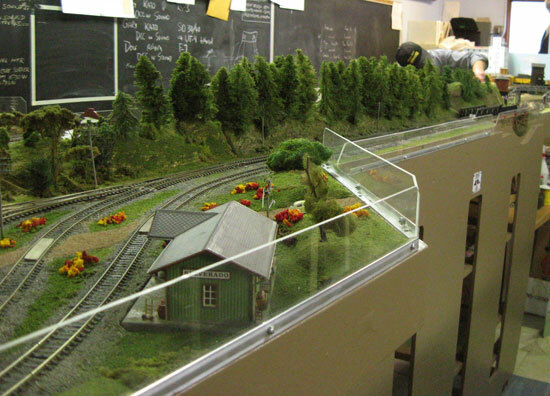 Our intention is to design and build a historical layout based on the railroads running through Collingwood to Meaford. Brad Lebeck is compiling a historical record and will design the trackplan with input from members. 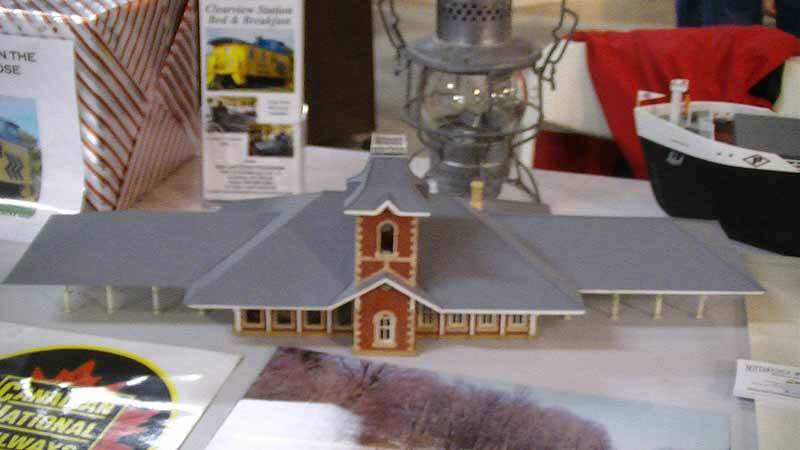 As of December 8, 2014 we were officially incorporated as a non-profit organization: the Nottawasaga Model Railway. Throughout the winter months work progressed steadily to make the new clubhouse fit for use. Bill Payne was our foreman for the renovation. By early March the ceiling and walls on the south side were insulated and work began on the north side. The clubhouse was ready for work on the new layout by July. By July we were just about ready to start benchwork construction for the new layout. 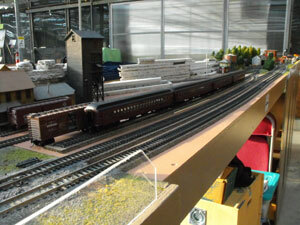 For the moment we'd moved in our travelling layout to prepare it for the Bracebridge Train Show in August. Brad Lebeck has completed the layout design that represents the CN line from Barrie through Collingwood up to Meaford. We intend to follow the track layout as closely as possible, especially the Collingwood harbour area. We're researching the history of the area and are interested in any photos, drawings or other memorabilia that can help us to recreate the region. Send me an email if you can help. Here's how far we've gone by September, 2015. 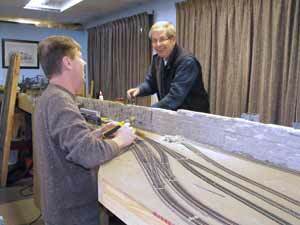 The clubhouse is operating and benchwork for the new model railroad has begun. 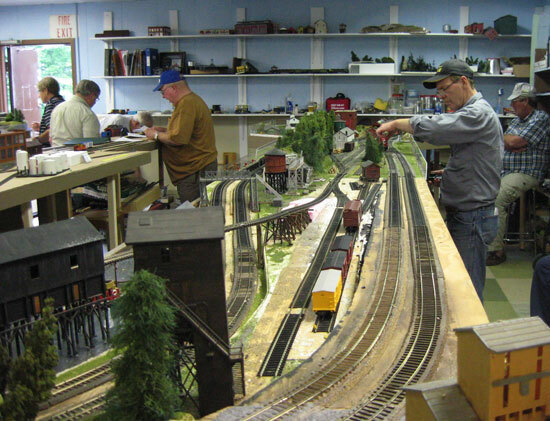 During the winter of 2014 we used Brad Lebeck's workshop for maintenance on our travelling layout modules. 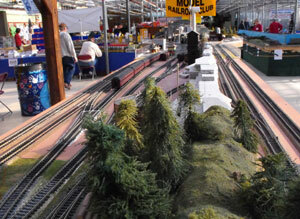 The Barrie train show took place as usual in February. Attendees were fascinated by the working coal mine and the signalling. Thanks to John for the signals and Brad for the operating coal mine. Brad has been leading the way in adding animation to the layout that can be operated by pushing buttons on the fascia. The coal tipple loads coal into empty hoppers. 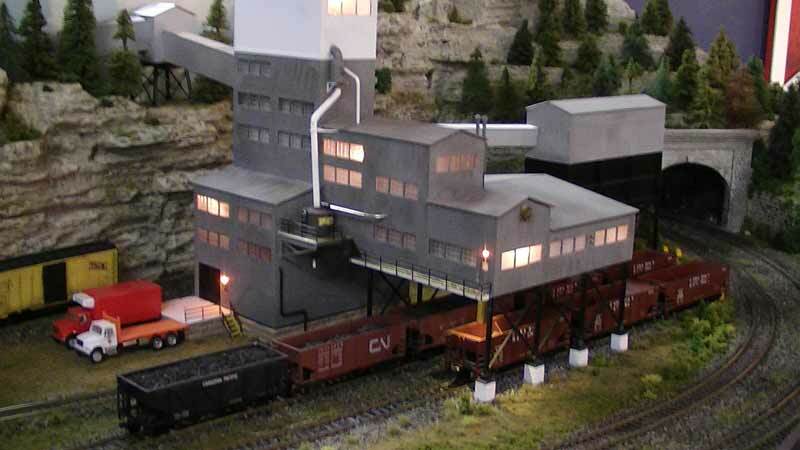 On the opposite side of the layout the cars can be dumped with the coal passing down through the rails into a bucket. Brad fashioned an ingenious screw-type mechanism and installed it in the coal mine building. He also has added a lot of lights. He has also added a hobo fire scene on another part of the module. Other members have been adding scenery and mini-scenes such as mouintain climbers on the rock face. A bear will be waiting at the top of the cliff! There is more about John's signalling work lower down on the page. Here is one of the push button panels recessed into the benchwork that John and Martin Alborough fabricated. The module on the opposite side of the divider has been reworked with a power station. This is the destination for the loaded coal hoppers. The loaded hoppers dump their coal between the rails and it is captured in a container below the benchwork. We have also attending the GNE Craft Sale to showcase out club to residents of Collingwood and Wasaga Beach. We were still hunting for a new home for the club at that time. Brad set up a table of historical exhibits about Collingwood including a model of the Collingwood station he is building and his excellent freighter model. I took a short video of the action on the new modules to show the working signals and coal mine complex. 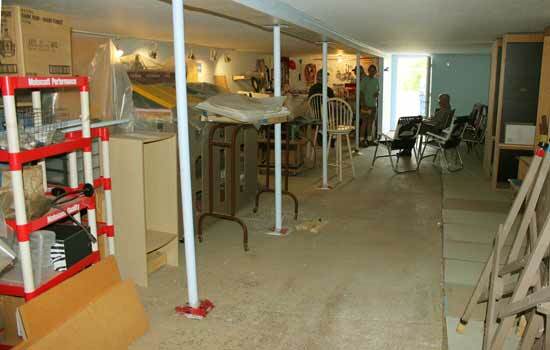 We were evicted from our clubhouse because the United Church in Wasaga Beach was rebuilding and had taken back its portable building. At first we met in members' homes and the exhibition layout was stored in our trailer. 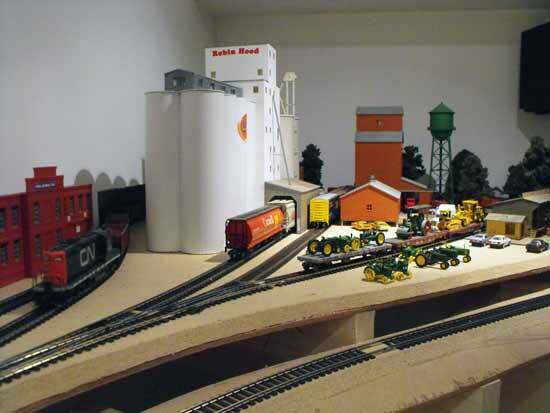 The rest of the layout was stored in a barn at Brad Lebeck's farm. We could still work on the new mine module in the workshop near the barn so work continued in preparation for the Brampton Show that autumn. 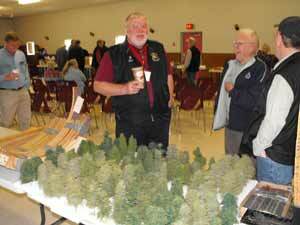 We took the exhibition layout to the annual train show in Midland. The new end modules were in use, although incomplete. The basic track and wiring had been finished and the double trackage on these modules allowed better operation in both directions than the single track did before. John Houghton had designed the electronics for the signals and built the signals and towers. We installed electric controls for the selenoid twin-control switch machines which is the first time we had opted to go beyond manual control. There is a divider backdrop between the two halves of the end modules that made it impossible to see the other side. The intention was to use the signals and turnout controls to alert operators to oncoming traffic. This is especially important at train shows where the noise level is high and operators are often conversing with show attendees or helping them to operate our layout. Here's a video to show what the layout looks like now. 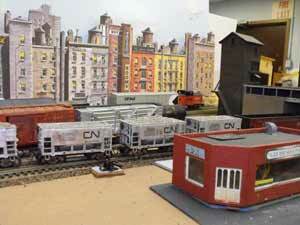 A video of several other layouts at the show can be found on my Train Videos page. Use the link in the right hand column. 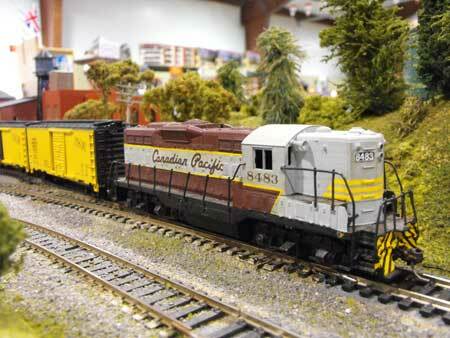 Our first show in 2014 was the Barrie Train Show at Bradford Greenhouses on the weekend of February 15 and 16th. The end modules that have had the old mine and mountain have been reworked. The mainline has been double-tracked for show use and Brad Lebeck has taken the lead in making the new mine operable. He hopes to have it running by the 2015 Brampton Show so attendees can see hoppers being loaded with coal. The new trackwork is completed and wired. Scenery work is underway. The ceiling tile cliff wall that acts as a scenic divider has been extended. The other side has a backdrop and a hidden storage track to hide a train for show use. The track will be signalled. The double tracked mainline will help at shows. This was single track before and sometimes we ran into problems when members were chatting with attendees. Someone always had to be on their toes to avoid collisions. We will probably block the inside track during club operating sessions to add some complication, in which case the signalling will become important. For those familiar with our travelling layout the new modules will be a novel surprise. 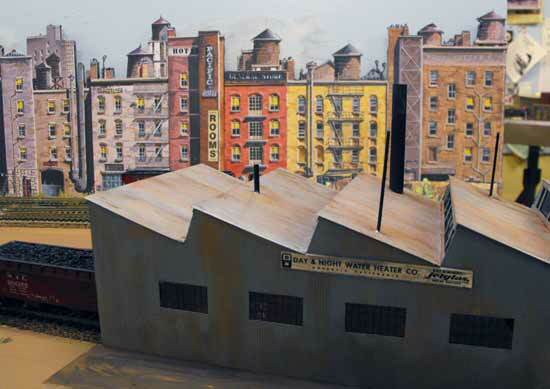 Paul Bailey has completed a park scene around the programming track. An old locomotive is "displayed" on the track in the park. It can be removed when the programming track is required. 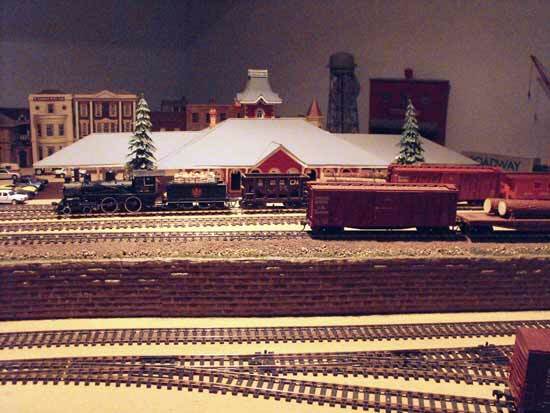 This incorporates the programming track into the scenery on the layout. Paul built a fence to enclose the park and added picnic tables, a swing set and some kites flying to dress it up. Meantime work progressed on other sections of the layout that do not travel to shows. I'd been working on the centre modules and fixing up the rolling stock with wheels and couplers while Club President Martin Alborough and Ken Douglas had been working out the operating scheme and building locations for freight movement. Cliff Lockhart and Dave Bryson were leading the gang constructing the engine terminal. Bill Payne was building the ferry slip. Everybody was busy doing something. It was a busy fall and winter! Unfortunately much of this work was to no avail because these sections of the layout would be discarded when we moved to Bygone Days Farm in 2015. 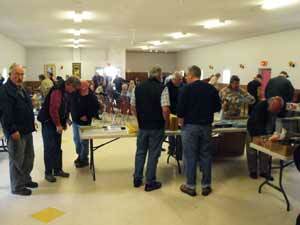 Our annual train auction was again held in Stayner at the United Church on the first Saturday in May. You never know what goodies will turn up! Mark it on your calendar for next year. 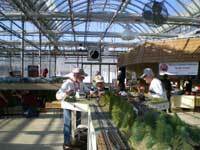 There are some photos from previous auctions lower down on this page.There are photos and mentions of the Nottawasaga Model Railroad Club (NMRC) and its members scattered throughout this website. That's because I'm a member and lots of what I write about involves the goings-on at our train club. I thought it would be advisable to give the club its own page so I can use it as a pointer to help you find information on my site that may be of use to you. We meet Monday evenings between 7 and 10 pm. Contact me if you're interested in coming out. We now have 21 members. We picked up a few new ones when we moved to Bygone Days Farm. Collingwood is about 2 hours north of Toronto, Canada on the shores of Georgian Bay. 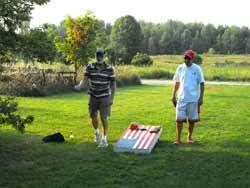 To orient you, it's about an hour west of Barrie, Ontario from the major 400 highway. 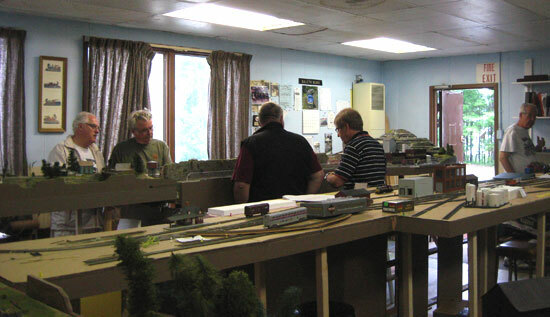 The Club builds and owns a modular layout that we take to train shows throughout central Ontario. 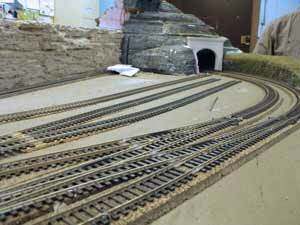 The layout, when set up in its original configuration, is a 26 foot long by 5 foot wide peninsula that widens to 6 feet at both ends to allow the track to curve back. 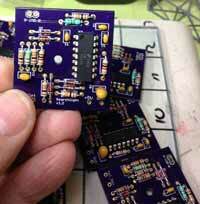 We have also been building additional modules to free-mo standards that splice into the midpoint of the layout. In 2011 we completed upgrading the layout's wiring for DCC Digitrax to be compatible with free-mo standards. One side of the new module could be used to keep passengers cars on a storage track. This was also to provide longer passing sections. 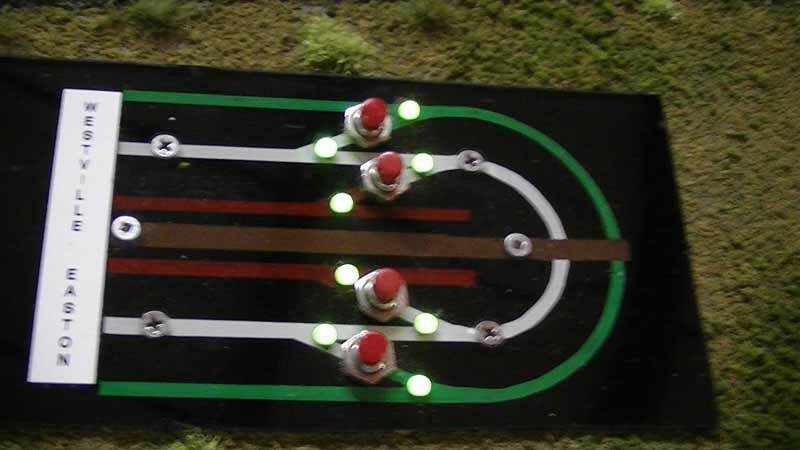 It also incorporates a reversing loop connection between both sides of the layout. The new module adds 4 feet to the length of the show setup making the overall length 30 feet. Not all shows we attend will be able to accommodate the extra length. 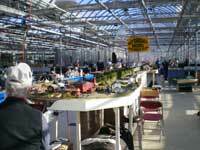 We tried out the new module at the 2012 Barrie Train Show. A scenic divider has been roughed in using broken ceiling tiles. 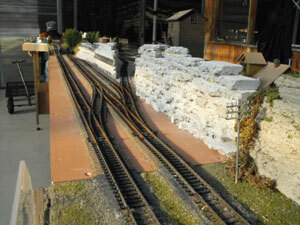 Scenery and ballasting weren't done until we made sure the track arrangement served our purposes at shows. Now members have a place to put engines or equipment that are not part of the operating schedule. 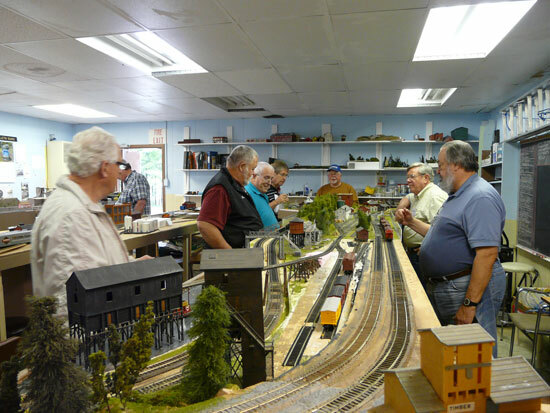 Train shows give members an opportunity to put some mileage on their trains. 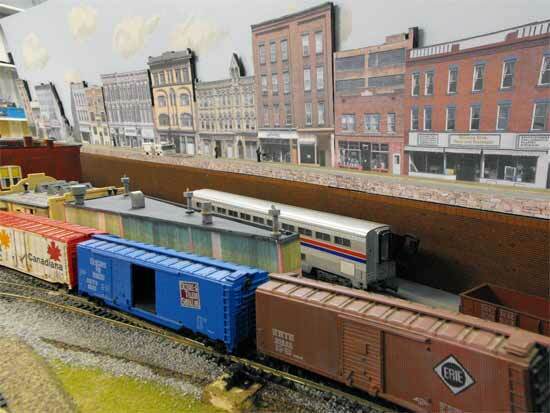 Not all of our members have home layouts or the mainline length we have at shows. We like to keep three or four trains running at all times during the shows. We gathered quite a crowd at the Barrie Show and had lots of youngsters running the trains.The third photo is an overview of the new module before track ballasting showing both sides. Most of our members were unfamiliar with DCC when we decided to convert from DC. We ran some clinics in 2010 about installing decoders in locomotives. These were non-sound decoders and we used a few of the club's old engines for demonstration. Martin Alborough has written a very good layman's explanation of how DCC works. Go to my NMRC club's website page to see it. 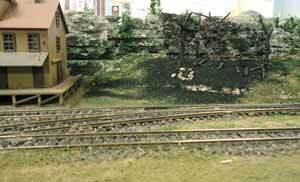 Below are listed some of the pages where you'll find more information about the NMRC layout. 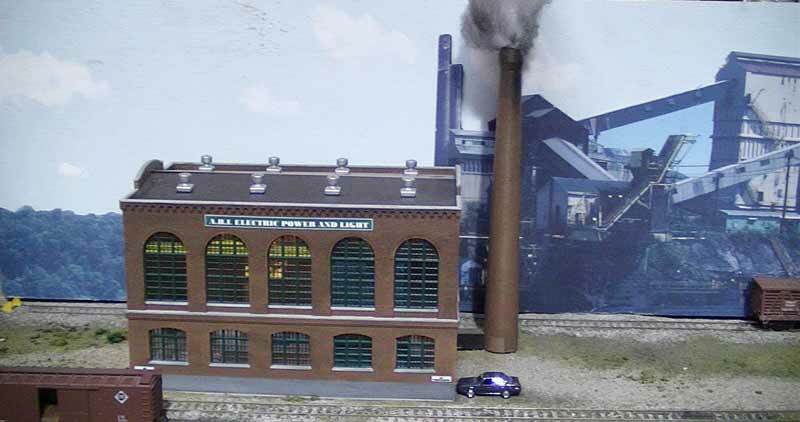 The layout also appears in a few of the videos taken at Barrie, Brampton and the Midland train shows. I'll post more videos here in the future. Stay tuned by subscribing to my RSS feed so you are alerted when there's something new here. The orange RSS icon is in the right hand column next to the headline "Recent Articles". Like most clubs, we're always interested in new members. If you live in the region and would like to learn more, send me an email from my Contact page. that appear on other pages. 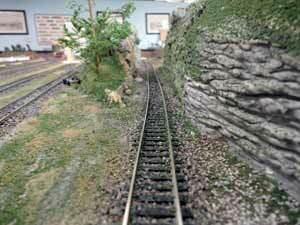 New photos of the NMRC layout will be posted on this page in future. Here's the schematic of the previous club layout that had more modules than the ones we took to train shows. Here's a short video shot at the Barrie Train Show, February 2010, featuring lots of steam and diesels and Brad's CN snowplow. This was the first time we'd used DCC since converting the layout from DC and installing Digitrax. Most members brought a couple of engines to run on the layout. 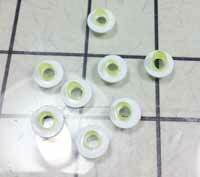 We'd never had so many going at the same time now that there were no more block toggles to throw. We could have used a dispatcher! We like to let children switch cars on the inside trackage while our members run trains on the outside main. We were a little concerned that youngsters would have trouble running trains with DCC but they picked it up right away, even a 4-year old! It's the older guys that are slow to learn. Need to play more video games or practice on a Wii! In the background you can hear some of our members teaching the kids how to switch the cars. You should have seen the smiles. 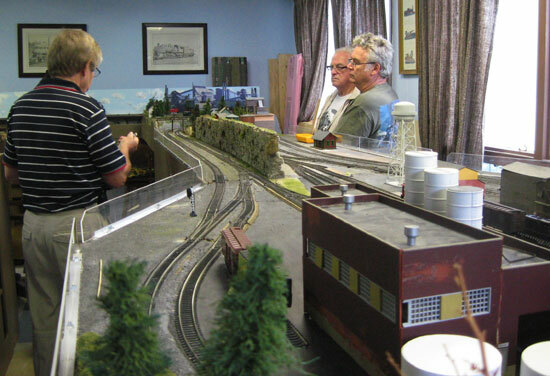 On June 25, 2011, the Club hosted members of the Canadian Association of Railway Modellers (CARM), Central Ontario Chapter, for an operations session on the Club's HO layout. In the photo Gord MacBride is completing switching moves while Les Mavor and Robert Sparkes wait for clearance to proceed into town with their trains. NMR club members acted as helpers. Fortunately, Martin Alborough had come to the clubhouse earlier in the day to put signs at all industries and spurs. 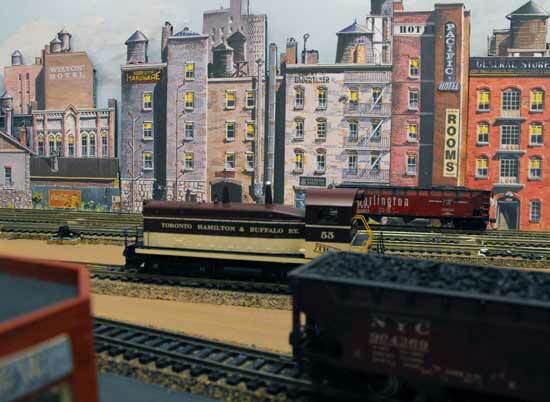 Several of the completed modules used at train shows are in the background. The tracks in the foreground curve onto the then semi-completed free-mo modules. The NMR members, some of whom are also CARM members, guided the guests through an operations session. Martin Alborough has adapted the typical 4-cycle car cards into a fixed cycle (instead of random). This allows quick set-up at shows because all car movements are predestined. Running four freights kept everyone on their toes as they tried to keep out of the way of each other! Guest Engineers were Gord MacBride, Les Mavor, Bill Osborne and Robert Sparkes with NMRC members acting as brakemen/conductors to plan and execute the switching moves at the industries. It took about 3 hours to complete the session. Guests were invited to bring their own DCC-equipped locomotives. The Club supplied the Digitrax controllers. Engineers were given printed switchlists and a schematic of the railroad. Here are some photos CARM member Robert Sparkes took during the session. The clubhouse configuration looking towards the town end. The newer modules leading to the free-mo section are in the foreground. The centre peninsula under construction. Temporary trackplanning is being done on the cardboard covered plywood base. at an engine servicing turntable. 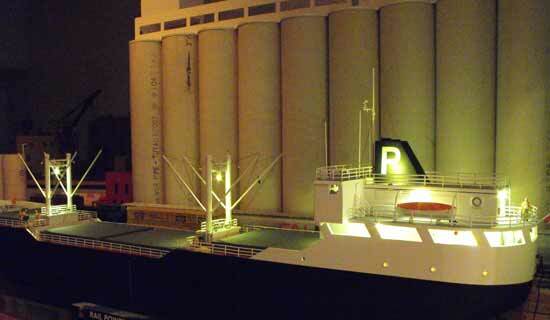 The far side will include a marine terminal with a barge and apron. Club member Doug Tate is sorting cars near the town modules. of the layout in the "clubhouse" configuration. 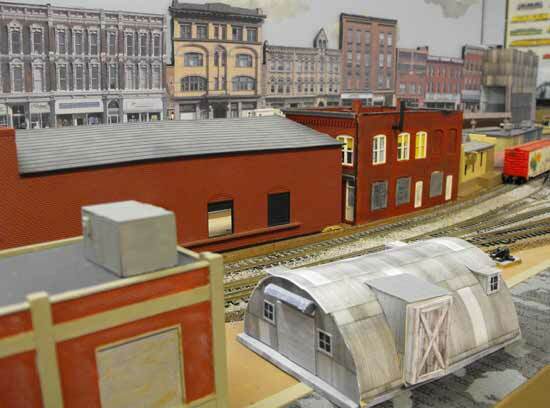 A view of a carrier module used to transport the layout to train shows. 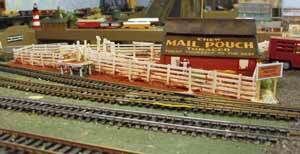 Acrylic fences have been added to protect scenery. The blackboard is handy for planning. 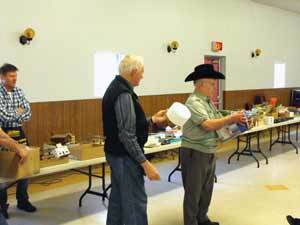 We also hold our annual model railroad auction on the first Saturday in May in Stayner, Ontario at St. Patrick's Hall. As noted above the 2014 auction will be on May 3rd. This year there was a lot of TH&B locomotives and freight cars in one lot. Several were DCC with sound and the rest, all brand new, were DC locos. Went for a song. Modellers always need trees. Our club made a bunch. They sold for about $1 a tree. in the various lots. Each seller gets his/her own display table. while auctioneer Gord works the crowd! Brad Lebeck waits in the background to collect the cash from the buyer. 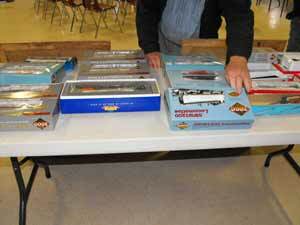 This is a great time to pick up bargains and to sell your own, unwanted model railroad items. Reserve bids are allowed. Cash sales only. There's a small admission charge at the door. Our club takes 10% for the price the seller gets. It's always fun and you never know what will be on he auction table. This year we had more than 100 people attend and more than 20 lots of goods. We also run a kitchen for sandwiches, cakes, cookies, coffee, tea and soft drinks. Here are a few photos. There are more on the Club's website. A fire scene takes shape. The finishing touches to the scenery are almost complete. It was decided to add a small forest fire scene to add interest. Walthers has a large forest fire scene on its showroom layout in Milwaukee. As one of our principal members, Bill Payne, is a retired fireman we felt it was appropriate to give him something to do on the layout. We have to acquire a fire engine for him. 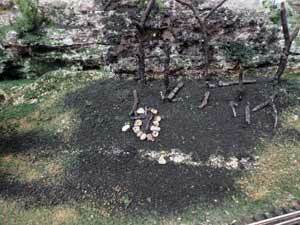 A little black spray paint and some twigs is all that's needed! The module includes a reverse loop connection. Ceiling tile cliff acts as a scene divider. Member John Houghton is building an N scale layout and is experimenting with interfacing JMRI software through his Macs to his layout. He has already made amazing progress. 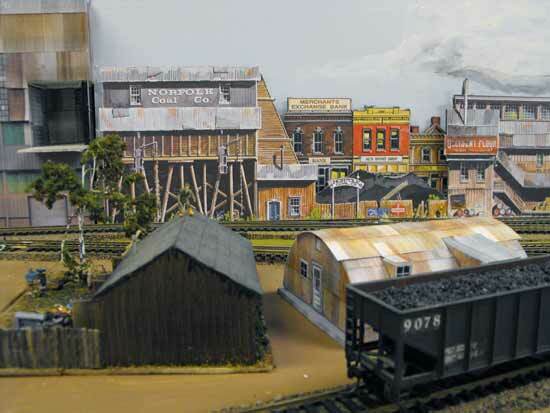 Have a look at John Houghton's layout. Like most clubs, we're always interested in new members. If you live in the region and would like to learn more, send me an email from my Contact page (in right Navigation List). 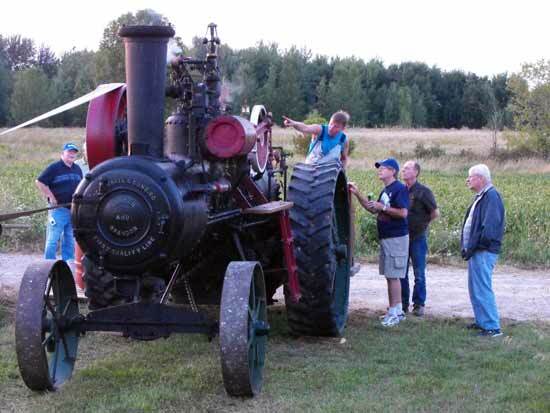 The taste of the corn cooked this way is outstanding and it's lots of fun to watch the steam tractor. 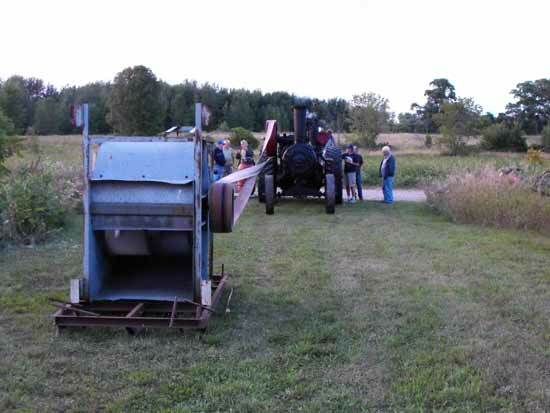 Brad also demonstrated the use of the tractor to turn a large fan with a belt. The belt would have been used for turning saw blades and such. Brad sometimes takes the tractor to Fall Fairs in Ontario. The fan is just for demo purposes although Paul and Michelle Bailey's young son loved standing in front of it and being blown over. The evening concludes with sparking fireworks when Brad loads up the fire with wood chips and revs up the engine. 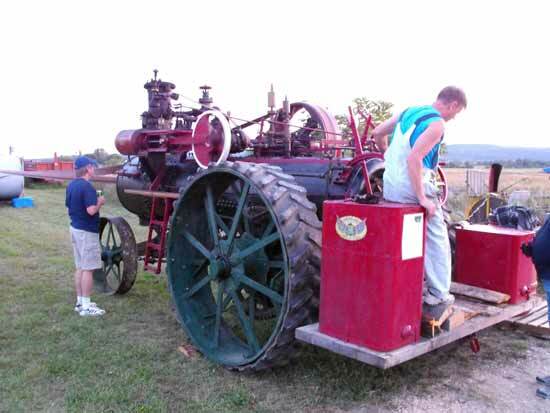 You can watch the steam tractor in action in this short video. 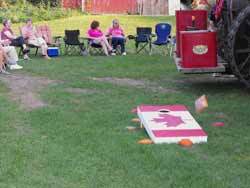 The ladies are more interested in talking than tossing bean bags! You can see in the photo how the track runs in the city street between the factories and the upper street in front of the backdrop. There is a 4-inch separation between the lower and upper streets to accommodate overpasses to the edge of the benchwork. A barge will be reachable at the right end of this module. Bill Payne hasn't finished the barge yet (nudge, nudge). A container crane was destined for the left end of the industrial area. Streets and scenery needed to be finished. The basic track wiring had been completed. Wiring for the Digitrax plug receptacles needed to be added and the switch frogs needed micro switches or some sort of powering to avoid relying on the mechanical connection of the point rails. The final module, the engine terminal, hadn't been started. 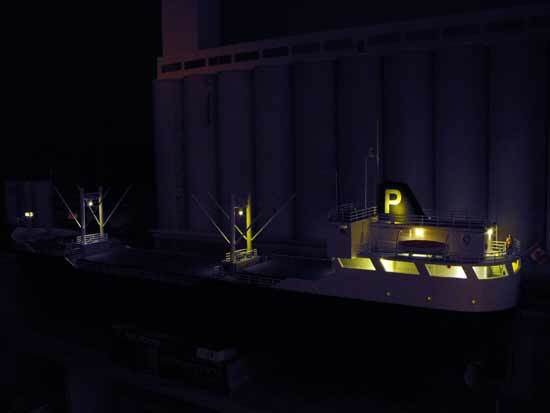 It would have had a common connection to both sides of the peninsula so that the turntable could be reached from the city or the industrial areas. Oh well, the new layout at Bygone Days Farm will be even better! 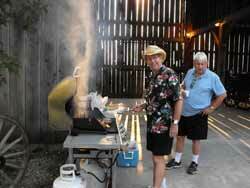 Brad Lebeck hosted our annual corn roast and again fired up his steam tractor to steam the corn. Sure tasted great! 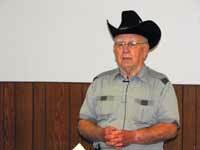 At sunset he pulled us around on his John Deere tractor to see his sugar shack and cabin in the woods. 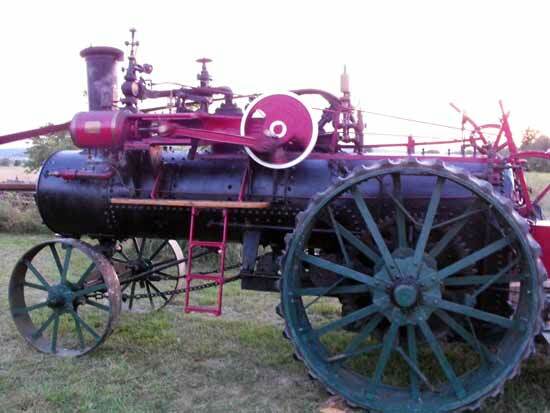 At sunset he fired up the steam tractor for a fireworks display of cinders. It's in last year's video. 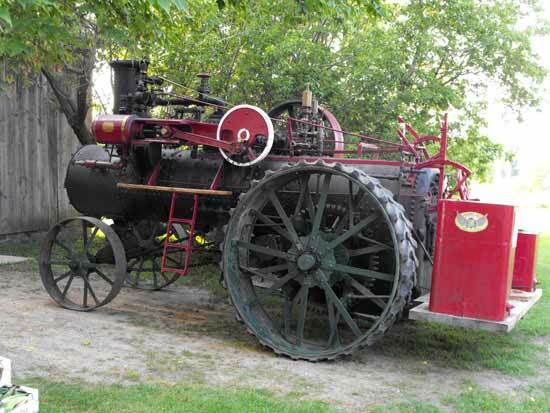 Here are a few more photos of his steam tractor. 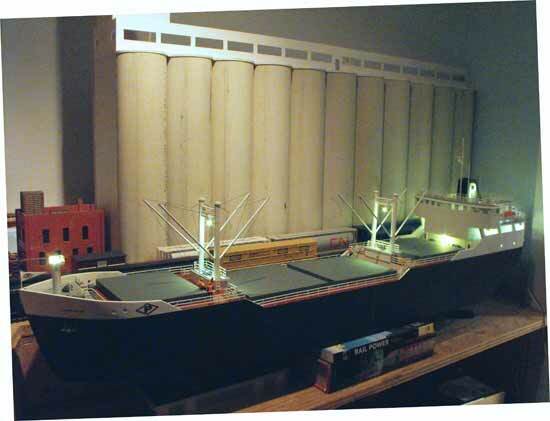 Brad has been working on his freighter that will have a prominent place on his HO layout. He has installed lights. Brad's ship at dusk dockside. The silos are ABS tubing. The freighter from above. This is all scratchbuilt. 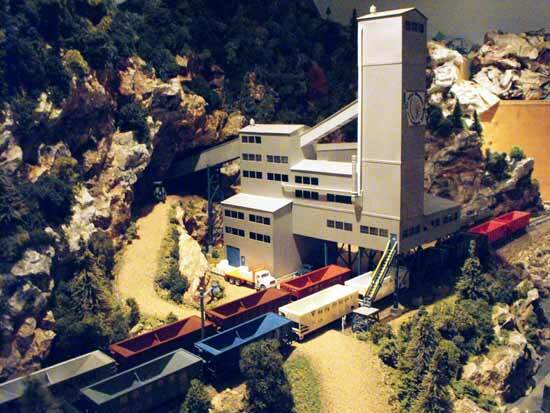 Another of Brad's scenes is this marvellous mine complex. He has been adding details. Brad hasn't had time to complete his town and agricultural scenes but they are coming along nicely. 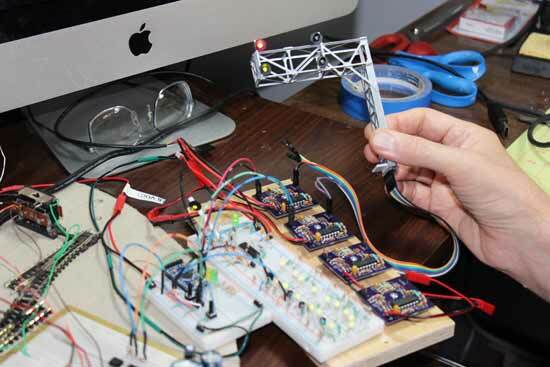 John Houghton took on the project of designing the circuits for signals on the new end modules and has built the cantilever signals using some kits as a starting point. He made his own LED targets. 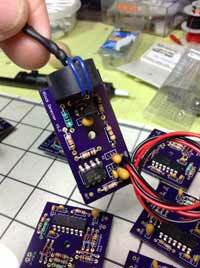 The club uses Peco twin-coil switch machines so John designed the circuit accordingly. The computer logic and LEDs are driven by a 5 volt line while the switch machines need 16 volts. He had to use opto-isolation to keep the circuits apart. The heart of the logic is driven by an onboard arduino computer chip to get the correct aspects to show when the turnouts are thrown. The aspects are copied on the panels that will be mounted as a building roof trackside. In the large photo above you can see the N scale Peco turnouts used for the test setup along with the freelanced circuit boards based on Paisley's circuits (referenced on my page about our experiments with scratchbuilt signal drivers) and the associated wiring cables. The Paisley circuits can be downloaded from the internet. We are planning to have the signals up and running this autumn. Signalling is needed because a backdrop divider obstructs a view of both sides of the layout. Should make for some interesting operation! Here's a pdf explaining the signal aspects and the complete technical documentation with all the schematics and Arduino software code for the construction of the electronics for NMRC signalling operations. Go to the Modular Layouts page. Go to Model Train Carry Cases. Go to Manual Turnout Control. Bill Payne's Locomotive Maintenance 101. Go to DCC block occupancy detectors. 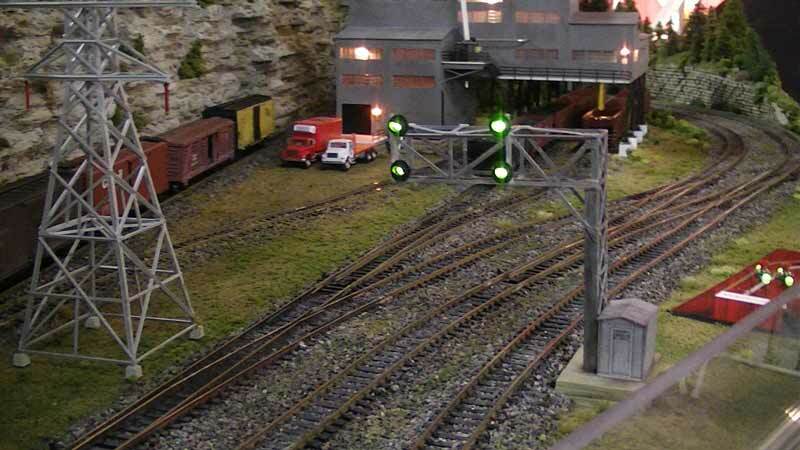 Go to our club's model train auction page. Return from "NMRC" to my Home Page.